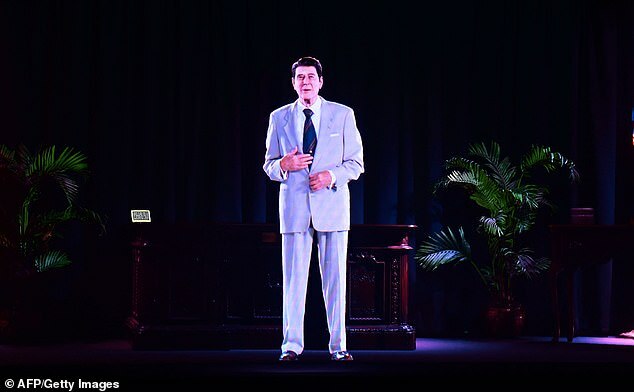 A new three-dimensional hologram revealed on Wednesday brings Ronald Reagan back to life in a $1.5 million exhibit at the late president's namesake library in Southern California. The state-of-the-art display is the first of its kind within presidential libraries in the US, Reagan Foundation Executive Director John Heubusch told USA Today, the Daily Mail reports. The exhibit being housed at the Ronald Reagan Presidential Library in Simi Valley, California will be opened to the public for the first time on Thursday. Reagan promises progress from beyond the grave thanks to audio edited from remarks he made during his lifetime. 'We think we made a good beginning, but you ain't seen nothin' yet!” the high-tech digital resurrection of the nation's 40th president says in a steady voice, with a twinkle in his eye. In another scene in the display, Reagan waves to a crowd from aboard a rail car during a 1984 campaign stop. At other times, he shows up in a suit and tie inside the Oval Office, or clutching a lasso at his beloved ranch, simultaneously appearing miles, let alone decades, away from visitors who are viewing him as if he's actually there in real time, at the library and museum situated just west of Los Angeles. The computer-generated imagery comes from photos and video of the former president combined with digitized hand-drawn illustrations that allow for realistic facial expressions and body movements. “We wanted to make President Reagan as lifelike as possible,” Heubusch said. To get this exhibit just right, the team hired an actor who was similar in size to Reagan with the same proportions and could mimic his mannerisms. When matching facial features proved to an issue, the museum commissioned a sculpture of Reagan's head to be used in creating the videos which would ultimately turn into the 3D representation of the late president. The sculpture was scanned from all angles using multiple cameras, with those images then attached to the top of the images of the actor's body. The most difficult part, Heubusch said the most challenging aspect of it all was getting the mouth movements in the hologram to appear to conform exactly to Reagan's words. 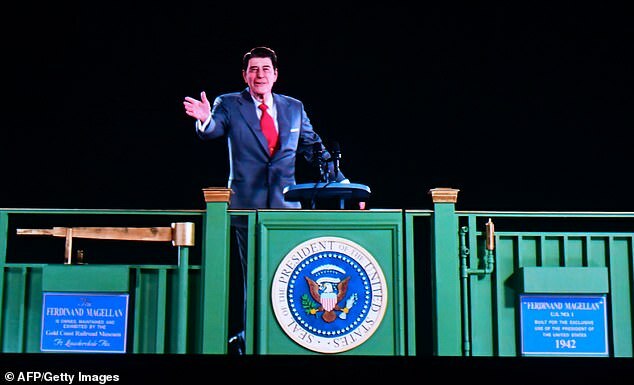 The team used Reagan's speeches and interviews for inspiration and banking on Hollywood post-production magic to tie it all together. The head, meanwhile, is still on hand, stuffed away in a bookcase in a cabinet at the exhibition site. As a radio host, television star and movie actor, Reagan understood and appreciated new technologies, Hologram USA senior vice president David Nussbaum said. “He always thought many steps ahead,” Nussbaum said. Reagan served as president from January 1981-1989. He was born on February 6, 1911 and died on June 5, 2004. His wife, Nancy Reagan, was born on July 6, 1921 and died on March 6, 2016.